AN UNTAPPED pool of 375,000 women and older people could help ease the labour crunch here, Singapore's largest employer group said yesterday. 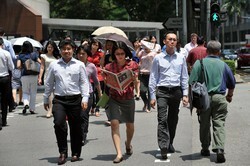 They could be coaxed back to work if companies adopt flexible work arrangements, the Singapore National Employers Federation (SNEF) said in its May Day message. SNEF president Stephen Lee cited government schemes to help companies wanting to implement job flexibility. "I urge employers to tap the WorkPro programme to embark on job redesign and flexible work arrangements. "Since WorkPro was launched, over 800 companies have received assistance through this programme to implement work-life measures and redesign jobs." The scheme was set up in March last year by the Manpower Ministry and Singapore Workforce Development Agency with a kitty of $170 million to be given to companies over three years. It offers subsidies for training and office improvements when companies hire older people or women who rejoin the labour force. Mr Lee acknowledged that different sectors have their own difficulties as the Singapore economy restructures. "SNEF will reach out to employers in specific sectors and work with their industry unions to proactively tackle their challenges," he pledged. He pointed out that companies can make better use of their workers and boost productivity on three fronts: By investing in training, motivating staff and creating a culture of innovation at workplaces. Mr Lee praised the National Trades Union Congress' (NTUC) progressive wage model, which involves wage ladders to boost workers' pay through training. He hopes to see more employers work with unions to implement these wage ladders. In a separate May Day message yesterday, Acting Manpower Minister Tan Chuan-Jin also lauded the labour movement for "spearheading the progressive wage model which puts in place clear wage-skill and career progression pathways for workers". He renewed a pledge to help workers and companies cope with economic restructuring, saying: "The Government is committed to help workers at all levels adapt to the new economic environment. The Government is also fully committed to helping companies transform their existing business models." Mr Tan noted that the strong three-way partnership of unions, employers and the Government is a "strong competitive advantage" for Singapore. "It is important that the Government, employers and unions continue to work closely together towards our common objective of making better workers and better jobs, so as to create a better life for Singaporeans." The NTUC kicks off its May Day celebrations with a dinner at Orchid Country Club today and the annual May Day Rally at the new Devan Nair Institute of Employment and Employability on Thursday. In a separate May Day message yesterday, Minister for Manpower, Tan Chuan-Jin also lauded the labour movement for "spearheading the progressive wage model which puts in place clear wage-skill and career progression pathways for workers".